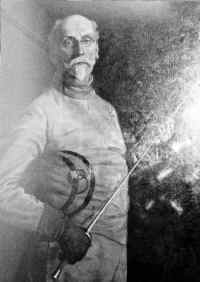 Alongside a large portrait by W Howard Robinson of Captain Alfred Hutton, first President of the AFA, is a mannequin dressed like Hutton in a fine herringbone pattern jacket and holding an epee and mask. 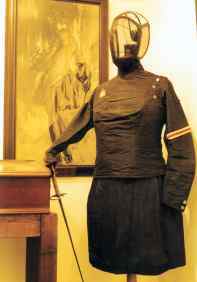 Another mannequin is dressed in the black silk jacket and skirt worn by a lady foilist depicted in a 1920s painting entitled The Fencer by Isaac Cohen. 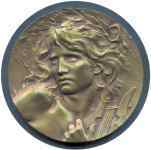 A self-portrait by Edgar Seligman demonstrates that the only man to win the British championship at all three weapons twice was also a talented artist. 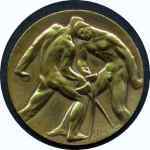 Other 20th century illustrations include a simple but elegant woodcut of two lady foilists of the 1930s, an impressionist oil painting of the Martini epee international and a dramatic photograph of the 1988 Olympic epee final. 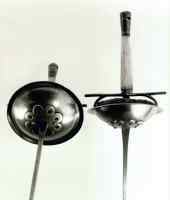 Up to the second world war fencing weapons continued to be made in a wide variety of styles and among those on display are examples of the first demountable sabre produced around 1910, an Italian epee dated 1915 inscribed as a gift from the great fencing master Agesilao Greco, polished nickel-plated examples of all three weapons from the 1930s, epees with triple points and with blades repaired with lead sheet, an early electric epee with a quadruple-point tip and a Russian glassfibre foil with plastic hilt – the lightest fencing weapon ever produced. 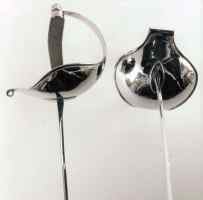 Other curiosities include a French fencing dummy with a flap in the chest that lifts to reveal a red cardboard heart, which makes a target when swung like a pendulum; one of the first six electric boxes made in Britain, still in working order after 50 years, donated by its inventor Dr Ron Parfitt; and a Wilkinson sabre mould from the 1950s together with a sabre blade blank, donated by Prof. John Sanders. 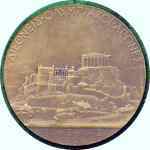 The earliest trophy in the museum is a silver pendant awarded to a pupil of the Glasgow Academy in 1856. 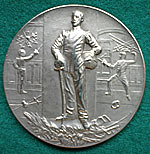 A collection of medals won by Charles Newton-Robinson, who first made epee fencing popular in England, includes a silver gilt plaque presented to members of the British team at the international epee tournament of 1904 in Paris, his participation medal at the 1906 Olympic Games and a commemorative gold medal for the 1908 London Olympics. 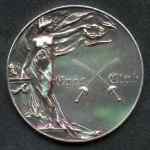 Other trophies on display include an Edwardian brooch in the form of a pair of silver foils crossed on a garland of leaves; a silver watch-chain fob prize won in 1906 by Sir Haviland Le Mesurier; an Oxford & Cambridge Boxing & Fencing Competition silver medal dated 1911; an Art Deco bronze medal presented in 1925, and a miniature silver epee on a stand awarded to Sergeant L V Clarke for winning the Royal Tournament epee competition in 1935. 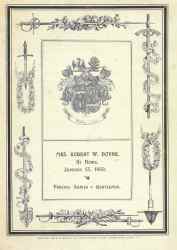 Among the numerous examples of fencing ephemera that can be seen is a lavish 12-page illustrated brochure produced for Mrs Robert W Doyne’s At Home on January 13, 1902. This was billed as a display between ladies and gentlemen to encourage fencing among women. A special train was arranged from Paddington to Oxford with reduced fares available on presentation of Mr Doyne’s visiting card. 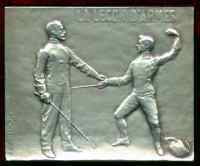 Although the Olympic Games of 1908 only featured epee and sabre, a programme shows that a special foil display was arranged between pairs of fencers from 11 countries, including UK foil champions John Jenkinson and Robert Montgomerie. Four years later a post-Olympic programme published in Sweden included photographs of the British team at all three weapons. Another programme for an international fencing display at Salle Bertrand in 1931 carries the signatures of the leading fencers of the day, among them Gwen Neligan, Muriel Freeman, Archie Corble, P G Doyne, Roger Crosnier, Emrys Lloyd, Leon Bertrand, Lieut-Col Ridley Martin, Gordon Pilbrow and Sir Oswald Mosley, MP. 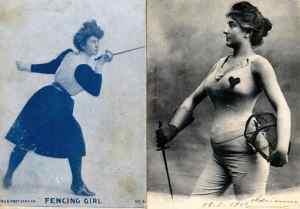 In the first decade of the 20th century postcards became popular and, in the form of Edwardian pin-ups, female fencers were soon depicted on them. 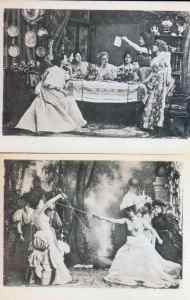 The collection includes two sets of French postcards illustrating a quarrel between two women, followed by a duel with epees in which the protagonists strip to the waist and are then reconciled after one of them is slightly wounded. 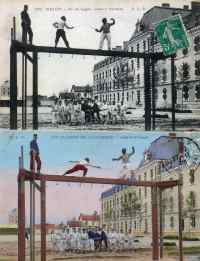 Of the many cards showing fencing in the army, two particularly impressive examples show a bout on a narrow beam about 6 m above the ground. British champions who were portrayed on postcards and cigarette cards include Edgar Seligman, Stenson Cooke, Archie Corble, Gladys Davis and Ian Campbell-Gray. Olympic gold medallist Gillian Sheen is shown on a stamp from the Dominican Republic.